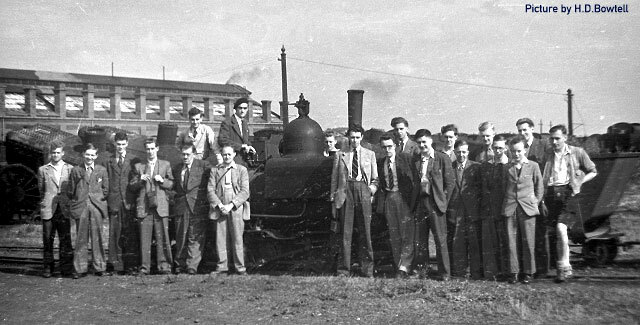 A visit to Horwich Works in 1949. The diminutive locomotive is 'Wren' dating from 1887 and used for delivering materials via the internal tramway system. The young lad third from the right in this photograph is none other than our esteemed treasurer, Syd Williams, who joined the society as a junior member. In the mid 1930s, when Stanier engines were just about to descend upon us and when many of the old faithfuls of the pre-grouping railways were about to be sent to the scrap heap, a group of very young railway minded enthusiasts used to meet on the. platforms of Manchester's main stations to observe the traffic passing into or through them. The con-joined Exchange and Victoria stations with the lengthy through platform V would provide hosts of LNWR, L&YR and Midland locos plus some of the GWR working into Exchange from Chester, Central station would host LNER locos of the old GCR and GNR plus the Midland, whilst London Road would provide engines off the LNWR, GCR, GNR and North Staffordshire. Added to this, these young men had some of the country's largest loco sheds on their doorstep such as Newton Heath, Gorton and Longsight, plus many others in the surrounding towns. From this background and from their meetings came the urge to profit from the enticing programmes of Sunday excursions run by the LMS and LNE which enabled them to get to loco sheds and workshops far away from Manchester at reasonable prices. By the mid 1930s most of these young men, who were mainly under 21 years of age, were members of the RCTS or SLS but they wanted an organisation which would cater primarily for the demands of Mancunians. There were five leaders of this group, by name Harold Bowtell, Neville Fields, Gerald Harrop, Bernard Roberts and Bill Young plus one other person who, at the age of 25, was the undoubted elder statesman, Charlie Harrop.These people made moves to form a Society of their own, and approached Mr.Evans, Station Master at Manchester London Road. He agreed to put a waiting room at their disposal for a meeting; it was at the adjoining Mayfield station and fixed for the evening of 6 December 1935. To provide an organisation centred upon Manchester for the study and discussion of the historical, engineering and operating aspects of Locomotives and Railways and to provide facilities and activities of interest to Railway Enthusiasts. The first outdoor visit was on 1st January 1936 to Crewe sheds and works and 22 people attended. This New Year's Day visit to Crewe then took place for many years except during the 1939-1945 war. The first indoor meeting was on 1st February 1936 in the Milton Hall on Deansgate when the constitution was adopted, after which Bernard Roberts talked about the Great North of Scotland Railway. Thereafter outdoor visits were arranged about every 2 weeks when the general arrangement was to travel out by an excursion train at a bargain price and return by the best timed Sunday express to suit our purpose at no extra cost by agreement of the railway companies. They also arranged reserved accommodation for us in each direction. There were regular visits to places like Derby, Doncaster, the North East and the Birmingham and Liverpool areas whilst on Saturday afternoons or Sunday mornings there were visits to local places like Gorton, Horwich or Newton Heath. In 1937 there was an overnight journey to London where a coach was hired which took us to 11 sheds. This was repeated in 1939 when the major sheds were visited again (Stratford and Old Oak for example) but including others which had not been visited in 1937. Travelling was usually by train (the railways actually required this for issuing shed permits), but in 1938 we went by coach to the Shropshire & Montgomery Railway at Kinnerley. The Society grew fairly quickly and by the end of 1936, 52 people had joined. At the end of 1937 the number had reached 81 and 12 months later 93 members had been enrolled. At the outbreak of war in September 1939, the number had risen to 110. Two events in those early days are worthy of note. In 1938 the LNER publicised its new rolling stock for the "Flying Scotsman" train by forming an old "Flying Scotsman" of GNR 6-wheel coaches and putting the old GNR Stirling 8'0" Single loco No.1 back into traffic to haul it. It ran between King's Cross and Hitchin but Harold Bowtell, on behalf of the MLS, and Will Whitworth on behalf of the SLS, approached the company to bring the train north. Their efforts were successful and many MLS members had the pleasure of travelling on the train behind the "Single" from Manchester Central to Liverpool Central in September. Also two members were responsible for introducing a new word into the vocabulary. The word was "gricer". In those pre-war days they were holidaying in the North East and on 12th August found themselves on the Durham moors in the Consett/Waskerley area. The story goes that two birds were seen (whether they were grouse is not recorded) but as the date was the start of the grouse shooting season it was decided that the plural of grouse was grice. After that the word came into common use for a "cop" or a loco seen for the first time and today it is in the Chambers Dictionary, meaning "a train spotter or railway enthusiast (noun - "gricer"). The Dictionary goes on to say that the origin of the word is uncertain but it was two of our founder menbers who coined it. Members were called into the armed forces from the very early days and by the end of 1944 we had 44 people on active service, 21 in the Army, 3 in the Navy, 18 in the RAF and 2 in the Fleet Air Arm. Two more at that time were Prisoners of War in Germany, both having been captured in the North African campaign at Tobruk. Many members were in the thick of the fighting, serving as tank crews, on warships in the Mediterranean and the Atlantic, as air crews in the RAF and Fleet Air Arm and involved in the invasions of Italy, but fortunately nobody was in submarines. Amazingly, every one of them returned safely to civilian life when hostilities ended. Indeed, we only lost one member who was serving in the forces and that was Jack Ellison who was with the Royal Engineers and died in India in 1947. A membership list drawn up at the end of 1944 showed that overseas members were serving in Europe, Asia, Africa and North America, some of the overseas bases being Baghdad, Bangalore, Belgium, Bengal, Cairo, Canada, Colombo, Greece, Holland, Italy, Madagascar, Nigeria, Poona, Tel Aviv and Transvaal, plus those on Destroyers and Aircraft Carriers. In post-war years the "call up" continued and many members went overseas on National Service. During the war a small but dedicated team kept the MLS afloat. These members who were still civilians did sterling work under the Chairmanship of Martin Shoults, Doug Darby, and Charlie Harrop. Charlie was in the army with the Royal Army Pay Corps and was based during most of the war on Stockport Road in Longsight, but he did an amazing job in keeping in touch with members serving overseas through circulars, letters etc. Charlie used to say that when in the army, he commuted to work from Heaton Chapel on the same train as he did as a civilian. When the war in Europe ended in May 1945 and in the Far East in August 1945, outdoor activities resumed and the first visit was to Gorton shed and works on 1 September 1945. Members serving overseas gradually returned home and by the end of 1946 most of those who were in uniform during the war were demobilized. In May 1945 the total number of members who had been enrolled in the Society had almost reached 150 although some of those had resigned for various reasons. 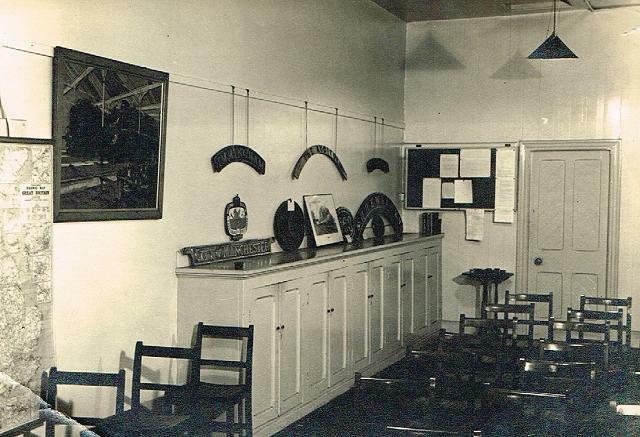 January 1955 saw the opening of a new Headquarters for the Society - pictured at the head of this page - at Manchester Central Station, in a room on the upper floor of a building in the goods yard, accessed through the ticket barrier on platform 1 on presentation of a Membership Card. The station closed in the 1960s, and the Manchester Central Conference Centre now stands on the site of the goods yard. The Society continues to flourish and we have around 189 members. We hold illustrated talks in our meeting rooms twice a month on a Friday evening, given by a guest speaker or one of our own members. We try to cover all aspects of railway interest but in particular focus on past and present events and locations in the North West. Our bi-monthly publication ‘The Mancunian’, contains articles submitted mainly by members covering the history of locomotives and lines, current events as well as personal reminiscences of the past. The Society is the proud owner of an extensive and varied library, photographic collection and railway archive material which is available to members.